A beautiful collection of vignettes about the meanings of material things from New Zealand’s past. In December I visited the Puke Ariki museum in New Plymouth, New Zealand specifically to view some colonial objects that had been converted, through theft, trafficking, and sale, into post colonial objects. Previously unstuck in time and place but recently returned home. 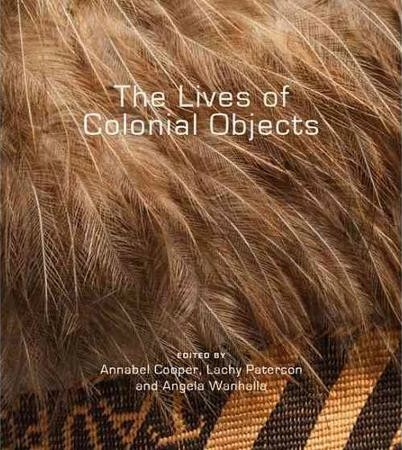 In the museum’s library I was shown the newly released book, The Lives of Colonial Objects: large and attractive, filled with compelling images of New Zealand as material culture mixed with memory. I tried to buy it in the museum shop but they didn’t have it yet. I was forced to wait until I was back in Scotland to borrow it on inter-library loan. It came…from the University of Pennsylvania. A book, printed in New Zealand which traveled to the United States and now to Scotland to get to me. A partial circumnavigation which collapses the distance between my first experience with the book (and, as it turns out, some of the objects within it) and with my experience of reading it and sharing it. The movement and connections of this book are so very like the items within it. But I am ahead of myself. I love the idea behind this book. The editors, inspired by Neil MacGregor’s A History of the World in 100 Objects, invited New Zealanders to submit very short essays about an object that tell a colonial story. Not the colonial story, a colonial story. They defined the colonial period as being from Maori/European contact up to the Second World War, but allowed that the objects may have continued to have meaning and use before and after those lines. From the submissions they chose 50 arranged in chronological then thematic order, illustrated on large square pages with beautiful photographs. The texts are tight, tender, and even personal. They tell the stories of individuals, families, communities, and cultures. I was enchanted by each one. So enchanted that I am not quite sure where to begin. An emotional colonial object for me: “Mrs Humphrey Devereux” by John Singleton Copley. 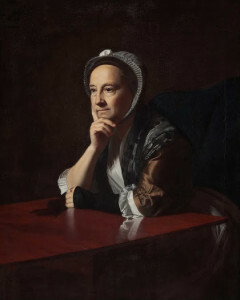 Painted in Boston in 1770 and now in New Zealand. I worked through the book slowly over the course of three days, in groups of four or five object vignettes, then reflected on each. I made a note of the salient thing that the small story left me with. The idea of a land court minute book playing a crucial role in the Maori experience of colonisation. The outdoor/freedom identity inherent in the billy can. A harpoon head turned into a Maori hatchet as symbolic of contact and combination. A grandfather who believes his grand daughter will never understand Te Ao Kōhatu, “the world past”. A building that is also a living thing. A flute that breathes. Each object is meaningful to the author but also to me as a New Zealand outsider but also a New Zealand lover. A beautiful and complicated place filled with beautiful and complicated things. But then again, I’m not an outsider and one of the objects, inevitably, binds me to time and place through my own personal connections. New Zealand has a portrait by Copley! I never knew and, somehow, I haven’t seen it. But there it is. It traveled from colonial Boston to London and then all the way to New Zealand as it passed through successive generations of the same family. I get emotional around Copley portraits. I have a stake in this. Indeed, I wonder if all non-New Zealanders reading this book might find their own connections to it. Objects have a way, don’t they? I enjoyed this book immensely. I’d certainly suggest it to anyone interested in colonial experience, object biographies, New Zealand stuff, and pretty pictures and stories of the past. If I didn’t have to return the book, I’d have liked to focus on one object a day, thinking about just that one while doing a bit of research around it. The book, amazingly, does tell a narrative through each object but it is a narrative that you can enjoy slowly over time if you like. Watch out, Kiwi family members, you might be getting this book as a gift for upcoming birthdays or other holidays.